Expanded application of advanced high tensile steel, including the use of 1.2 gigapascal Ultra High Tensile Strength Steel with High Formability, in production models. (YOKOHAMA, Japan; 03.12.13) - Nissan Motor Co., Ltd. today announced its plan to expand the use of Advanced High Tensile Strength Steel (AHSS) in to up to 25 percent of the vehicle parts (measured by weight) installed in its new production models. Nissan will make use of advanced high tensile strength steel starting in 2017 as one of its initiatives to help reduce vehicle weight. Nissan has developed*1 1.2 gigapascal (GPa) Ultra High Tensile Strength Steel with High Formability and has employed it in the new Infiniti Q50, which goes on sale in North America in 2013. Prior to the development of 1.2GPa ultra high strength steel it had been difficult to use high tensile steels for vehicle parts with highly complex shapes. Nissan continues to be the only auto manufacturer*2 using 1.2 GPa Ultra High Tensile Strength Steel with High Formability. 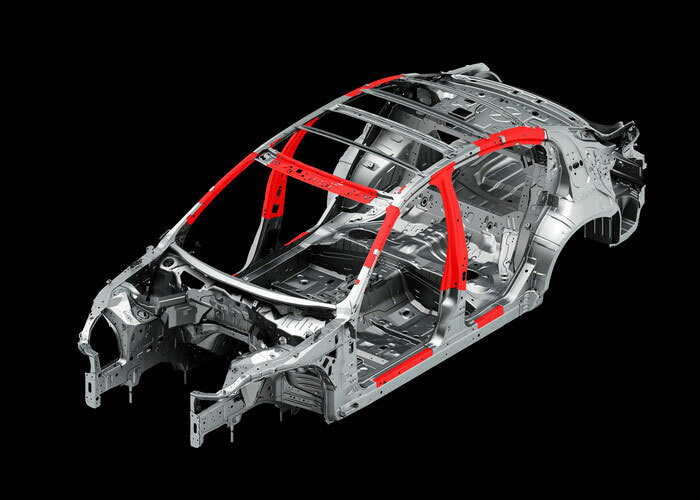 With the active adoption of 1.2 GPa ultra high strength steel, which is one grade among several types of advanced high tensile strength steels, Nissan will increase the adoption rate of AHSS as far as 25 percent of the gross weight of the parts installed per vehicle. This effort will begin in 2017 and aims to reduce the weight of Nissan's vehicles by 15 percent with corresponding body structure rationalization. GPa Ultra High Tensile Strength Steel with High Formability provides greater elongation, and offers strength and high formability, to make lighter-weight steel sheets. These attributes enable it to be used for parts with complex shapes, which had been difficult to manufacture using established high tensile steels. Combined with high-precision die design and a welding process suitable for materials during the production process, the 1.2GPa Ultra High Tensile Strength Steel with Formability can now be applied to the production of more vehicle parts. In addition, employing 1.2 GPa high tensile strength steel leads to fewer materials used per vehicle produced, and existing production lines can be used without a big modification. This results in a reduction in total cost per unit. Under the Nissan Green Program 2016, Nissan's mid-term environmental plan, the company is aiming for a 35 percent improvement in fuel economy compared with 2005 on a corporate average for all Nissan vehicles by the end of fiscal 2016. To that end, the extensive use of Advanced High Tensile Strength steels, including the new 1.2GPa ultra high tensile steel, will contribute to reduced vehicle weight and better fuel economy. *1 Jointly developed by Nissan Motor Co., Ltd., Nippon Steel & Sumitomo Metal Corporation and Kobe Steel, Ltd.
Nissan Motor Co., Ltd., Japan's second-largest automotive company, is headquartered in Yokohama, Japan, and is part of the Renault-Nissan Alliance. Operating with more than 248,000 employees globally, Nissan provided customers with more than 4.8 million vehicles in 2011, and generated revenue of 9.4 trillion yen ($US118.95 billion). With a strong commitment to developing exciting and innovative products for all, Nissan delivers a comprehensive range of 64 models under the Nissan and Infiniti brands. A pioneer in zero-emission mobility, Nissan made history with the introduction of the Nissan LEAF, the first affordable, mass-market, pure-electric vehicle and winner of numerous international accolades, including the prestigious 2011-2012 Car of the Year Japan and 2011 World Car of the Year awards.